Fly for free in economy from select gateways or save $2,000 per couple on this sailing. Click here for eligible departures. Sail to the busy port of Rotterdam. Later, continue sailing toward Veere. This morning, cruise into Holland’s Zeeland province. This evening, unwind with a sundowner drink on the deck of our ship, taking in splendid views of the Dutch countryside. Dock at the medieval port city of Antwerp and continue to Brugge, known for its Gothic architecture and picturesque market squares linked by cobbled streets and serene canals. The entire historic center of Brugge has been declared a World Heritage site. 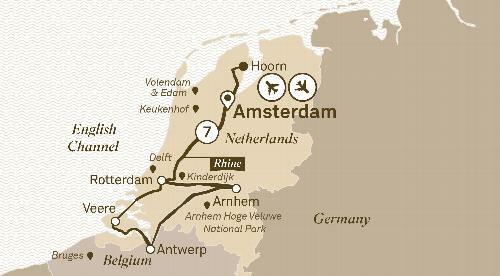 Cruise through the countryside to Arnhem, once an important trading center in the Hanseatic League—and later the site of a historic Allied assault during World War II. Freechoice: Explore the fishing village of Volendam. Next, on a tour of Edam, visit a cheese warehouse and sample some of the round cheese for which the city is known. Alternatively, discover the charming town of Hoorn with a guide, and taste some of the local delicacies. If you wish, bike to a nearby tulip farm, where we’ll learn about the flower production process from bulb to auction market, Or visit a paprika farm. This evening, join local residents for a special dinner, enjoying traditional food, friendly conversation, and insights into life in the Netherlands. Explore the fishing village of Volendam. Next, on a tour of Edam, visit a cheese warehouse and sample some of the round cheese for which the city is known. Alternatively, discover the charming town of Hoorn with a guide, and taste some of the local delicacies. If you wish, bike to a nearby tulip farm, where we’ll learn about the flower production process from bulb to auction market, Or visit a paprika farm.